Move over, calamari. How UGA and Southern chefs are working to bring this local jellyfish mainstream. Cannonball jellyfish are plentiful on Georgia’s coast. After chef Matt Marcus decided to introduce jellyfish to the high-end Southern menu at his revamped Watershed, he hit a snag. Marcus had bought the 20-year-old, James Beard Award–winning restaurant in April, eager to make his mark. 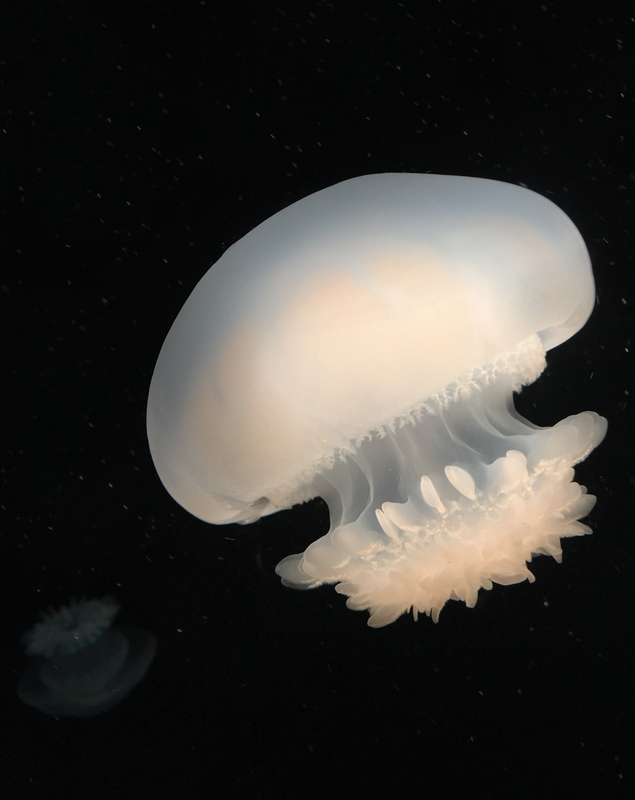 He was fascinated to learn that cannonball jellyfish—a smaller cousin of the feared shore demon but harmless to humans—is Georgia’s third largest fishery by volume, after shrimp and crab, thanks to demand from markets in Asia. He decided to serve the catch, called jellyballs, to further promote and showcase Georgia’s seafood industry. No other Atlanta restaurant he knew of was offering it. All started well. His first batch of fresh jellies arrived in a FedEx box from Golden Island International in Darien. Unprocessed, jellyballs feel like a raw scallop—a pale pink blob that’s firm under a squeeze—and look like tiny umbrellas. Marcus found that they share flavor and texture with octopus and cuttlefish, though he says jellyfish can taste “a little cleaner.” For the version that appeared on the menu, he rolled and trussed the jellyballs and dunked them in liquid nitrogen. Then, he sliced them like noodles, blanched them, and sauteed them in butter with shallots, serving them twirled up in the center of an Ossabaw hog consommé with a poached egg. Marcus says customers flipped for the dish, which he called a Georgia carbonara. Then, his key ingredient ran out. Jellyball season runs from late fall to mid-spring, depending on ocean temperature, which makes the window for fresh jellyballs somewhat short. Not knowing this, Marcus asked Golden Island for another round. A gallon bucket of the company’s mainstay arrived: dried and salted jellyballs, shelf-stable for two years and wildly popular in China, Korea, and Japan, where they’re beloved for their crunchy texture and eaten as a salad. Marcus wasn’t sure what to do. The jellies were so stiff, he threw one against a kitchen wall with a loud thwack. Reconstituting a preserved jellyball requires a 10-hour soak in water to remove all the added salt, Marcus learned. But after a long steep, and then another, the brine remained. “It’s so salty, it blows out the palate,” Marcus says. Further attempts to desalinate failed, so Marcus removed jellyfish from the menu. Despite the setback, support is on the way. This fall, a collaboration launches between Golden Island International, the University of Georgia Marine Extension and Georgia Sea Grant, and southern chefs with the intent to increase domestic sales of jellyfish beyond Asian markets and sushi restaurants. The idea is to bring jellyballs to creative kitchens with the hope that cooks will devise interesting new ways for diners to enjoy them. Harper, for example, hadn’t considered that a chef like Marcus would want fresh jellyfish. No one had asked for it before. She hopes American cooks can find uses for Golden Island’s dried jellyfish, but she’s eager to supply other versions if needed. The company might be able to flash-freeze fresh jellyballs to keep Marcus’s Georgia carbonara on the menu year-round. Or perhaps they can ship large quantities of fresh product to Atlanta, where Marcus can preserve the bounty—trussed and dunked in liquid nitro, just as he did before—as if it were a summer glut of tomatoes. The partnership, the participants hope, will help figure this all out. When in season, local jellyfish are plentiful and can help meet the overseas demand for them. In less than 30 minutes, trawlers can haul thousands of pounds with minimal bycatch, says Bryan Fluech, associate director of marine extension for UGA Marine Extension and Georgia Sea Grant. The style of nets deployed to capture jellyballs rarely ensnares sea turtles. “It’s probably our cleanest fishery,” Fluech says. In Atlanta, Marcus is eager to do his part. He’s found that jellyballs absorb whatever flavor is added to them in cooking, not unlike tofu. In his earlier experiments, he figured out that frying them can yield good results, as can a low-and-slow braise. But it’s tricky. Because they’re mostly water and collagen, jellyballs melt into a gelatinous slime after too much heat and time. Marcus has been most successful with his deep freeze and quick scald method. Correction: An earlier version of this story misidentified UGA’s Marine Extension and Georgia Sea Grant. This article appears in our October 2018 issue.